Creating epic content takes time and effort beyond belief. So, how do you get it done? You need a writing habit. I do, too! Here’s what I’m doing about it. Writing a lot is a skill. And like any other skill you can improve it by practicing every day. To create a writing habit, you need a routine. Set aside a specific time when you will write. Every day. And weekends… Christmas. Hungover… Every single day. Start with smaller pieces of content. Every paragraph or section of your epic content can stand on its own. You can make it a small blog post, case study, rewrite a description for a related service. Write and publish something regularly. Regularly doesn’t mean every day, but to keep the momentum, I suggest that you write every day. I have never been a very fast writer, and the experience has often been like pulling teeth. To overcome this, I committed to writing something every day. Writing every day is by far not an original idea, but it is really effective. Create a word document, Google Docs or any other text document and write something in it every single day. And I mean EVERY day. Saturday, Sunday, sick day, and your birthday. Action: Make a decision and do it. Do it first thing in the morning. I know that everything needs to be done first thing in the morning. But if you are serious about installing this habit in your brain do it first thing in the morning for at least 30 days. Pick a number of words. If you feel that writing is something really hard, then I suggest you start as low as 200 words per day. Scale up from there. Increase your word count by 10 every day, and by the 30-day mark, you reach 500 words per day. In the beginning, when the words don’t come easy to you set a time limit of 40 to 60 minutes. Make a rule that you write at least X words or 60 minutes. If you see yourself as someone who’s main productivity is in the form of the written word you should start at 500 words. Set a time limit of one hour. Keep in mind that this is not about typing speed. The 500 words you write daily are the first draft of a piece of text that has ideas and flow. No copy and paste. Sometimes you copy quotes, links, and other material into your writing. These do not count towards your daily goal. Count only the words that you typed yourself. Action: Write about why you want the writing habit or any other topic that is familiar to you. Get a timer and set it for 60 minutes. Timing will give you an idea of how fast you write new material and where to set your daily word count limit. 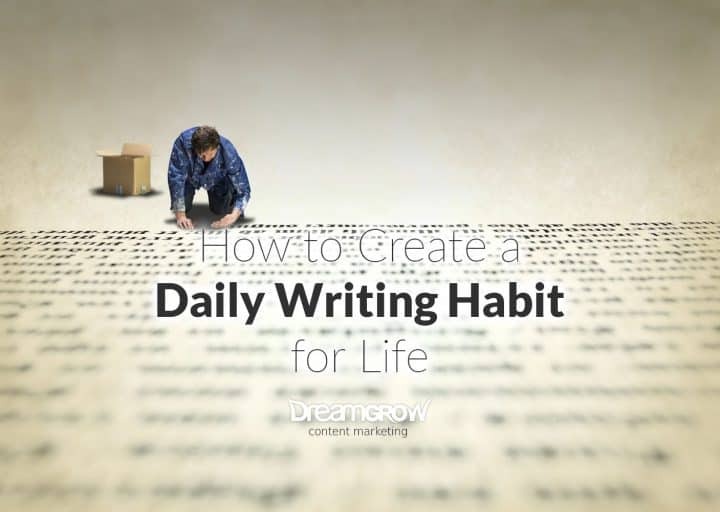 What to write in your daily habit building exercise? First of all, this is deliberate practice. You sit down and write your words in one go. You don’t count the work-related emails or chat with friends. Other than that write about anything. If you want to improve your website content start with a new blog post. Write a structure of sub-headings. Add key points for each segment. Elaborate each point with a sentence or two. And in no time you have yourself a brand new blog post. You can do the same with product descriptions and services. You don’t have to write about the same thing every day. However, that would be the fastest way to get something published. But if you think that today you would like to write about the weather outside, that’s fine, too. The main goal is to build the writing habit, increase speed, and thought flow. Action: On the first day write about what to write about. Create a list of topics with a sentence or two as an explanation. In the beginning, just write! Don’t think about publishing. Don’t think about what others may think. Don’t mess around with blogging platforms, formatting, and other tech toys. All this will just get you distracted. Focus. On. Writing! Action: Make a decision if and how often are you going to publish. When will you do it? Create a calendar to edit and publish your content. The time it takes to publish content may surprise you. Focus on writing. Write even if it’s bad. You are building a habit of expressing yourself. Your skill will improve over time. Your clarity of thought will improve. You will be able to better express yourself in writing and speech. Another benefit of this writing habit is that you will train your brain to be more creative. You will be able to come up with new ideas and express them much faster. You can read more about becoming an idea machine here. Action: Use a spellchecker and always focus on the mistake you made. 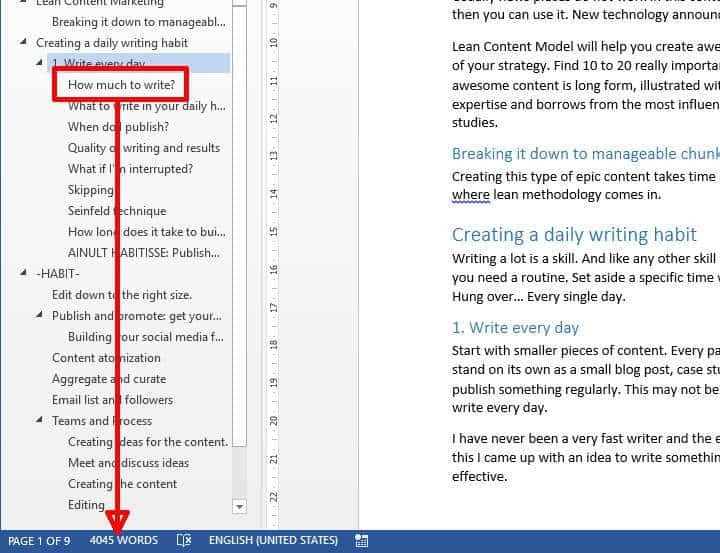 Use Hemingway editor to make your writing easier to read and understand. When using Hemingway editor pay attention to the mistakes you make. Make a point to avoid them next time. Turn off all the interruptions for the time of writing habit building exercise. But even then emergencies come up, and you may need to stop before you reach your daily goal. Make sure you come back the same day and finish your word count. Add a hundred words so your brain wouldn’t get any ideas about finding emergency excuses to get off easy. If you can’t finish on the same day double the words for the next day. Action: Do not go to bed before you have completed your daily writing task. Don’t break your writing habit. Write every day. Even if you feel that there’s nothing to write about. Write about how there’s nothing to write about. Look out of the window and write what you see. The key is to build a habit. Consistency is the key! In the initial months, the unbroken chain of writing days is the most important thing. More important than the quality of the content created. Get a big calendar that has a whole year on one page and put it in a prominent place. Get a big red magic marker. For each day that you do your task of writing, put a big red X on that day. After a few days, you’ll have a chain. Just keep at it, and the chain will grow longer every day. You’ll like seeing that chain, especially when you get a few weeks under your belt. Your only job next is not to break the chain. Action: Get the calendar and the marker. But if you slip? Don’t let your brain come up with any excuses and write twice as much on the following day. If you have unexpected insane workload for some reason, then you can reduce the daily task to half. If you had a 500-word goal make it 250. But not for more than a few days. I am on my 304-day streak writing this sentence, and I have 431 words to go to get my chain to 305 days. This whole post is part of my habit-forming process. Update: Now 254 days later on day 558, the writing habit has really taken root, and my writing speed has nearly doubled. I don’t mean the speed of typing but how fast I’m able to get ideas and form sentences to express them. The typing speed is not much faster. This seems unbelievable when I look back to my first 30-day writing challenge. Another improvement that I noticed is that there are almost no days when I don’t have something to write about. How long does it take to build a writing habit? There’s a myth that you can build a habit in 21 days or month. It will take considerably longer than that. The research shows that on average a habit takes 66 days to form. Harder things, like writing, take even more time. So, when you start to build a writing habit consider that it will take you about three months. After that it becomes automatic. Plan ahead! 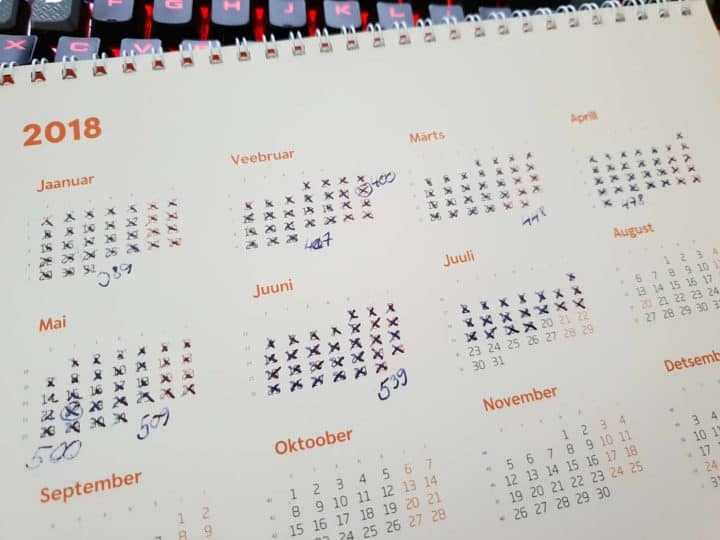 During the three-month period, there will be times when you want to skip. You can rationalize skipping your habit building for days. Don’t! Skip one day, and you can pick it up. Skip twice, and you are lowering the chances of getting the new habit installed. By a lot! Action: Make a decision! 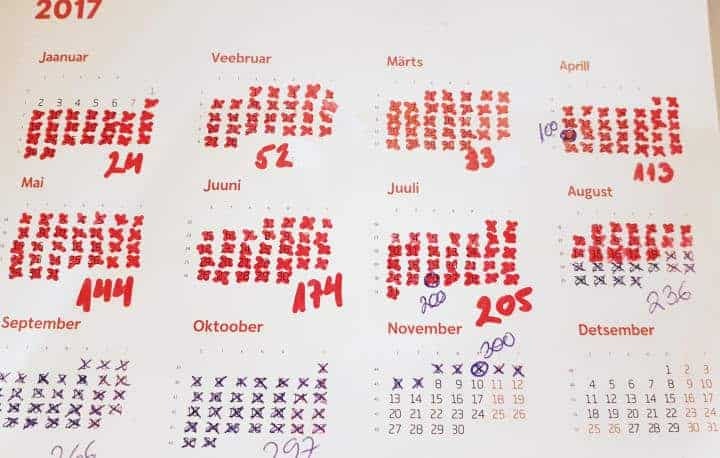 Next 30 days you write every day. And then another 30. During the habit-forming period of your writing career, you may publish or just write for yourself. I suggest that you publish something at least every other week. You have to consider that publishing means editing. Editing takes more of your time and does not count towards your daily habit building volume. If you choose to publish, ask for feedback from your readers. Feedback helps you improve. However, don’t take the comments too seriously. Your goal at that point is to build a habit that will stick with you for the rest of your life. Always go back and check if you can publish something. The feedback you get helps you improve your writing. And sometimes it will motivate you. I published a short piece of content in my Estonian blog. It sat in my writing doc for almost 6 months. After publishing it, one reader commented that it was the best piece of marketing content he had read the whole year.